Algarve-Holidays So you want a holiday to suit yourself,your partner and your children.Will you find it in the Algarve?Yes you WILL! The Algarve is like Devon; with year round sunshine!In fact you can get there just as easily and your holiday will cost less so the extra cost of flights will not be prohibitive.Check out our Flights page FLIGHTS.Get your best prices on our page without leaving the site and do your homework on flights,it is so easy now,you can have your flights booked in minutes! Also check out car hire you can book a car to pick up at your destination airport;how handy is that. It does not matter what sort of holiday you recquire you should find it in the Algarve.Do you like golf well the golf courses are some of the best and prettiest in the world and golf is a year round prospect in the Algarve.Whatever sort of golf holiday you have in mind is well catered for;whether it be just for yourself or for a large party,you will find it very easy to arrange.For lots more golf-information, Please follow this safe link on this site. For families everything you can think of is catered for.Horseriding no problem and there are many nature reserves to ride through not to metion waterside or rugged and hilly.Many family excursion are on hand including water world and zoomarine.The beaches are amongst the best in the world and a hotel,villa or apartment situated right on the water front are plentiful.Is your scene camping;then there are many campsites in varying situtions,whether you want to be right in the action with lots of others;or in some peaceful inland valley in more isolation appeals to you.The terrain is so like Devon with rugged windswept cliffs,gentle rolling landscapes,peaceful valleys and far superior beaches.You want a hidden quiet beach or a busy tourist hotspot;they are all here.You can even find beaches such as Monte gordo with restaurants right on the beach where you can sample fish caught by the locals that very day! Algarve-Holidays For the watersports enthusiast the western end of the Algarve is worldclass.Every type of watersport is practised here thanks to the wonderfull blustery Atlantic breezes.This end is known as the end of the world;though nowadays we have cottoned on that Brazil is just across the water.You will find a good crowd of surfers etc at this end of the Algarve nearl all year round.Everything in the Algarve is year round.I have had breakfast on a sunny balcony in early January. You might think that Britain is the place for history but the Algarve can easily match it.The Romans used to book package holidays to the Algarve.I think flights were hard to come by then however!Roman architecture can be seen everywhere.The city of Tavira has a Roman bridge still in daly use.To my mind Tavira is a must for the tourist.It is a timeless unspoilt city;high-rise does not exist here and the local authorities have no intention of letting it and the surrounding areas being spoilt.By law nothing can be built over three stories high.Situated in the east Algarve they say this region is fifteen years behind the rest of the Algarve.In the nice respects this is true but you are not cut-off and all modern facilities are easily available!Tavira is a little jewel with riverside restaurants and lots of small interesting shops.On the city outskirts you find the Islha de Tavira which basically is a superb beach resort.River cruises and sea cruises and small fishing villages and Lagoons and nature reserves and history and,and,and...Abound in this area.Going back to our general history,the Moors who ruled Spain also ruled in the Algarve and much evidence of Moorish architecture is still in evidence.Of course Portugal also has a rich maritime history.While the English etc invaded North America,the Spanish and Portuguese discovered South America.No accident this it is just that geographically they happen to be directly opposite their respective conquests. Algarve.So if this is your bag;you will have a wonderful time and you will find the sites full of many nationalities who all mingle with great affability.These are a great favourite with both the Germans and the Dutch in particular and you will find them very friendly.They really do not fit the undeserved prototypes we English tend to have of them.Give it a try you will not be sorry you did. Finally if your thing is the traditional tourism of sunny beaches and sunbathing and general chilling.Then the Algarve is second to none.The Portuguese have made themselves the experts in fullfilling your needs.They are VERY PROUD of the quality holidays they provide. 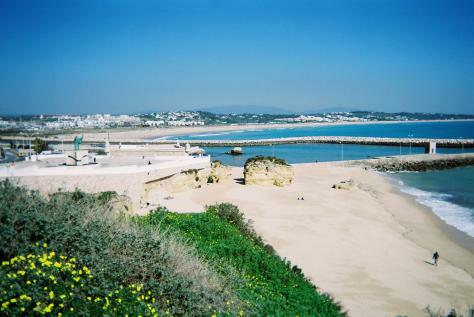 Algarve-Holidays So we have covered many types of holiday but have left out many others.However I think from the information given;if for example you wanted a walking holiday,you could work out that the Algarve would be an ideal place to indulge yourself! All the major tour operators such as first choice,Thompsons and Tripadvisor operate exstensively throughout the Algarve.So you will be able to find whatever type of holiday you want.It is estimated that some 80 different airlines fly in and out of Faro Airport. Although the temperatures get as high as virtually all the famous hotspots,the heat in the Algarve is nowhere near as oppresive.Why should this be? Well there is a very good reason and that is geographic location.The entire coastline,some 150 kilometres plus,opens onto the Atlantic Ocean.This leads to refreshing sea breezes and fine clean air.There is just no way the air can become stale and heavy like mediteranean climates. I have been in the Algarve in the city of Faro and seen temperatures of 41 degrees celsius but it was nowhere near as sweaty as for example the high seventies in the United Kingdom. For those who love sporty' or active holidays you will find it all here!Look through the Algarve information heading to your left and browse our activity pages,you will find enough to keep any "adrenelin junky" on a high.If you want to try some new sport or activity on you Algarve-Holidays you will find schools of instuction exist for "most everything". Discover France with experienced travelers who share with you a decade of travel tips, information about specific regions and sites and language helps. Come with us as we explore the hidden gems, cycle the Loire Valley, explore chateaux, and sip wine in the Burgundy region. Let our favorite country become your favorite country.